In this article, I’m going to share some of the important things you should know about Magatama. Magatama improves your basic stats; Life, Attack, Defense, Ninjutsu and Resistance. The higher your Magatama level the higher your basic stats. Leveling up Magatama will increase your battle power as well. **There are some players who managed to upgrade their Magatamas to Level 9. I did not manage to upgrade my magatamas to level 9 yet so I’m not sure with the stats. How to level up your magatamas from level 1 to level 9? If you want to purchase Level 2 Magatama for Life, Attack & Ninjutsu to achieve Level 9 it will cost you – 15 (ingots/coupons) x 2,187 magatamas = 32,805 (ingots /coupons) $USD 656 for one magatama. If you want to purchase Level 2 Magatama for Defense and Resistance to achieve Level 9 will cost you – 12(ingots/coupons) x 2,187 magatamas = 26,244 (ingots/coupons) $USD 525 for one magatama. If you want to purchase Level 4 Magatama for Life, Attack & Ninjutsu to achieve Level 9 it will cost you – 135 (ingots/coupons) x 243 magatamas = 32,805 (ingots /coupons) $USD 656 for one magatama. If you want to purchase Level 4 Magatama for Defense and Resistance to achieve Level 9 will cost you – 108(ingots/coupons) x 243 magatamas = 26,244 (ingots/coupons) $USD 525 for one magatama. As you can see, whether you level up with Level 2 magatama or level 4 magatama the amount spent is exactly the same. How to Get Magatamas in Naruto Online game? Ninja Exams (Free) – When you complete Ninja exams, you will get level 1 Magatamas. 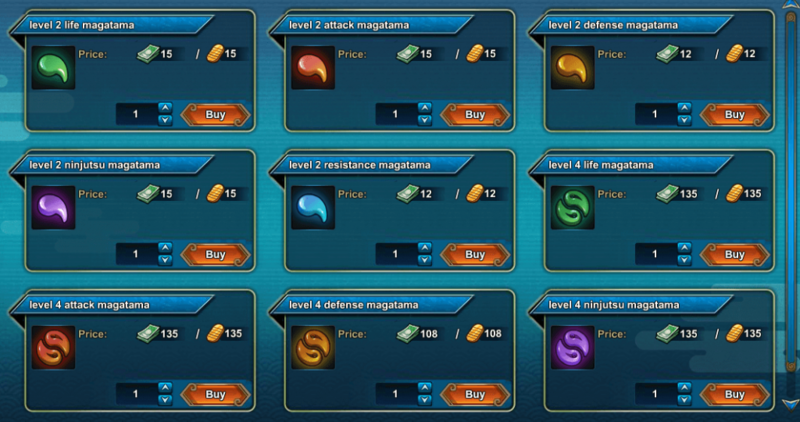 Shop – (Coupons/Ingots) – You can purchase Magatama Level 2 and Level 4 from the Shop. Activity Lucky Bag (Free) – You will receive random Level 2 Magatamas from this event when you accomplish required missions and get points. Total Spending Rebate (Ingots) – You can get Magatamas of Level 6 and 7 from this event. Keep an eye on this event. Konoha Outlets (Coupons / Ingots) – You can purchase Magatama Level 5 during this event. As it is time-limited make sure to save up your coupons or recharge for ingots. Fateful Choice – This event comes once in a while, you can accomplish certain missions and get points to redeem Level 4 Magatama pack. Group Lucky Wheel – It depends on your Group’s Lucky wheel level, you will have chances to get Magatamas from Level 1 to Level 3. Rescue Jinchuriki – When you take part in Rescue Jincuriki at 18:00 on Friday and Saturday will help you get Magatama rewards. Ninetails Invasion – When you get high ranking on Nine Tails Invasion event not only you get coupons but also Level 2 Magatama depending on your ranking. Make sure to focus on leveling up your magatamas and increase your battle power. Did I miss anything else about magatama? Please share it with us by commenting below.